I have this little corner of my mind called "The Greatest Fantasy Maps Ever." In that place I keep a little secret file of maps that I think represent truly amazing works of genius. The Oeridia Dominions Map by Twan is one such map. What makes it great isn't the artistic skill. 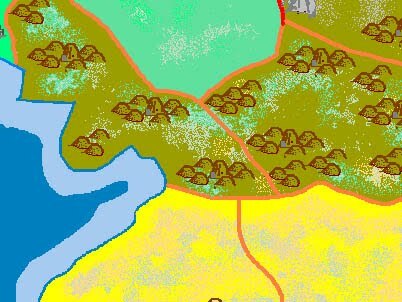 If you look at a detail of the map, you'll see that the techniques are pretty rudimentary. What makes the Oeridia Map great is its scope and completeness. The maker of the map had a clear vision which he fully executed using whatever tools he had at hand despite the fact that it must have taken a truly unreasonable amount of time. The same could still be said of a huge number of fan projects on the Net (I know I've made a few myself). But of them all, I like this one best. The Oeridia Map is 9800 x 5700 pixels in size, yet it contains artistically rendered villages, bridges, and terrain features as small as 8x8 pixels. That's a pretty impressive information density. 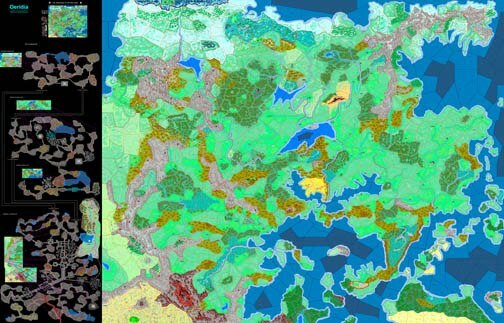 This map is big, and not just in terms of file size. Everything about it reinforces the bigness of the world it's portraying. This looks and feels like a world so big that you could only ever experience a piece of it in your lifetime. It helps to have played Dominions yourself, because just visiting every province on this map in a single game is probably impossible within practical limits. Note also that an attempt has been made to make every province at least somewhat individualized. Some contain unique features. Terrain features are created using repeated icons, but these are mixed so that the regions do not contain just one kind of terrain. 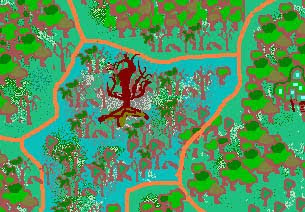 The arrangement and mix of trees, for example, is clearly intended to make each forest distinct. But it's not obsessiveness that makes this map great (although that helps), but imagination. The way that the underworlds are rendered as a mix of natural caves and constructed places is inspiring (and probably helped inspire How to Host a Dungeon truth be told). But I none of that explains why I get chills when I look at this map. I guess that really it's because the map feels like it's showing me a real place -- in just enough detail to feel real, with just enough mystery to make me wonder what it would be like to go there. What this map is is what I want my games and my art to be: specific and detailed, but offering an endless horizon for exploration.